The competition is over.Visit our main page for more free licensed software. 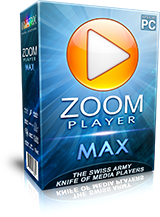 Zoom Player ist der schlauste, flexibelste und anpassbarste Medienplayer für Windows PC und Tablets. Es basiert auf der leistungsstarken 'Smart Play'-Technologie und bietet euch Vollbild-Navigation-Interfaces, die Möglichkeit, mehr Medienformate problemlos abzuspielen, verbesserte Stabilität und optimierte Leistung sowie vereinfachten Zugang per Maus, Tastatur oder Touchpad. Hinter dem klassischen Look von Zoom Player versteckt sich ein Media Center mit einem intuitiven Vollbildschirm-Interface. Das fünf Tasten (Oben/Unten/Links/Rechts/Wählen)-Navigationsinterface bietet euch einfache und schnelle Navigation sowie gleichzeitigen Zugang zu fortgeschrittenen Programmfenstern wie z.B. Medienbibliothek, Dateibrowser, Playlist Editor, Farbeinstellungen, Audio Equalizer, Lesezeichen, Abspielverlauf usw. Die Einfachheit des Zoom Player Media Centers macht es perfekt für Benutzer ohne Vorkenntnisse. Mit Zoom Player wird jeder PC sofort zu einem Home Entertainment Center (HTPC) ohne zusätzliche Hardware oder Betriebssystemanpassungen. Mit Zoom Player Install Center bleibt euer PC immer auf dem Laufenden mit Hilfe der letzten verifizierten Playback-Technologien. Für eine Videoanleitung für das Install Center klickt bitte hier. Ihr könnt mehr über Zoom Player und weitere Produkte auf der Inmatrx Webseite erfahren. Bitte beachtet: Die Giveaway-Lizenz unterstützt keine Upgrades auf zukünftige Versionen. Wenn ihr die Giveaway-Lizenz behalten wollt, empfehlen wir euch, keine Updates zu installieren. Dieses Programm kostet normalerweise $29.95, doch unsere Gewinner bekommen es kostenlos! Habe diesen Player schon früher in dieser Version 13.5 ausprobiert (gab es schon öfters kostenlos). Ich sehe keinen Vorteil gegenüber dem Windows Standard Media Player oder VLC. Neben der unpraktischen Optik gibt es aber auch noch ein Problem mit automatischen Updates (aktuell ist 13.7.1), die von der kostenlosen Version nicht unterstützt werden. Eine neuere Version entfernt die kostenlose Registrierung! Somit wird der Player vielleicht zum Sicherheitsrisiko!!! Irgendwie ist der Funke nicht übergesprungen. Zum Thema Mediaplayer: einfach einmal Chip.de oder ComputerBild.de bemühen und einfach durchprobieren was einem liegt. Habe diesen Player schon früher in dieser Version 13.5 ausprobiert (gab es schon öfters kostenlos). Ich sehe keinen Vorteil gegenüber dem Windows Standard Media Player oder VLC. Neben der unpraktischen Optik gibt es aber auch noch ein Problem mit automatischen Updates (aktuell ist 13.7.1), die von der kostenlosen Version nicht unterstützt werden. Eine neuere Version entfernt die kostenlose Registrierung! Somit wird der Player vielleicht zum Sicherheitsrisiko!!! Irgendwie ist der Funke nicht übergesprungen. Zum Thema Mediaplayer: einfach einmal Chip.de oder ComputerBild.de bemühen und einfach durchprobieren was einem liegt. Ich kenne keine sozialen Netzwerke. Es gibt also nicht eine Möglichkeit für mich zum Download. Sehe ich auch so wie Jürgen. Außerdem bin ich kein Facebook Nutzer. Sehe ich auch so wie Jürgen. Außerdem bin ich kein Facebook Nutzer. Was soll das denn? I don't do Facebook or any other so-called social media. I used a previous version, long removed, but will pass on this. Seems a pretty ill thought our and stupid way to market a product and judging by the comments so far I do not think I'm alone in thinking this. Totally agree with some below that VLC and Potplayer does everything you need. I don't do Facebook or any other so-called social media. I used a previous version, long removed, but will pass on this. Seems a pretty ill thought our and stupid way to market a product and judging by the comments so far I do not think I'm alone in thinking this. Totally agree with some below that VLC and Potplayer does everything you need. Aside from the fact that this $30 retail software does nothing that's fundamentally superior to that achieved by the always free, continuously updated, and multi-talented VLC Player from non-profit organization VideoLAN, today's giveaway leaves me. . . baffled. According to today's page, it's "a contest", the winners of which will get this product "for free" (though unlike VLC Player, without any future updates.) Contest entrants will, however, only qualify for consideration if they sign up to receiving newsletter from a developer they may never have heard of / aren't remotely interested in . . . or if they share this page with others on Facebook. I don't do Facebook or Twitter or Linked In or Instagram or Google Plus nor ever will. Why? Because I'm not a commodity. And because I know that the individual most prized by Facebook, Twitter, Linked In etc is the individual they haven't yet identified and so haven't yet monetized.
" I am not going to comment on the share/login/etc that giveawayoftheday uses as we have no control over that"
If eleven years after it revolutionised the global software sector and created an entirely new marketplace, GOTD Giveawayoftheday -- "every day we offer FREE licensed software you'd have to buy otherwise" -- is about to turn into COTD Contestoftheday -- "every day we urge you to either use social media that you don't want or sign up to developer emails which you don't need" -- then I'd suggest a re-think is immediately due. Thanks as ever then, GOTD, but as for COTD: absolutely no thanks. Aside from the fact that this $30 retail software does nothing that's fundamentally superior to that achieved by the always free, continuously updated, and multi-talented VLC Player from non-profit organization VideoLAN, today's giveaway leaves me. . . baffled. <b><i>Because it isn't.</b></i> According to today's page, it's <b>"a contest", </b>the winners of which will get this product "for free" (though unlike VLC Player, without any future updates.) Contest entrants will, however, only qualify for consideration if they sign up to receiving newsletter from a developer they may never have heard of / aren't remotely interested in . . . or if they share this page with others on Facebook. I don't do Facebook or Twitter or Linked In or Instagram or Google Plus nor ever will. Why? Because I'm not a commodity. And because I know that the individual most prized by Facebook, Twitter, Linked In etc is the individual they haven't yet identified and so haven't yet monetized. Fingers crossed then that today's episode is specific to this developer's product, albeit the answer to post #1 by the developer itself: <b><i>" I am not going to comment on the share/login/etc that giveawayoftheday uses as we have no control over that"</b></i> is anything but reassuring. If eleven years after it revolutionised the global software sector and created an entirely new marketplace, GOTD Giveawayoftheday --<i> "every day we offer FREE licensed software you'd have to buy otherwise"</i> -- is about to turn into COTD Contestoftheday -- <i>"every day we urge you to either use social media that you don't want or sign up to developer emails which you don't need" </i> -- then I'd suggest a re-think is immediately due. Thanks as ever then, GOTD, but as for COTD: absolutely no thanks. I had a previous version that I lost in a major crash. It made me happy when it came here today but now I am very disappointed because You discriminate against people who do not use social media. Shame on You. I don´t want to have anything to do with discriminating developers even if their software is as good as Yours. The program is available for $ 29.95, but the winners of our contest will get it for free. I had a previous version that I lost in a major crash. It made me happy when it came here today but now I am very disappointed because <b>You discriminate against people who do not use social media. Shame on You. I don´t want to have anything to do with discriminating developers even if their software is as good as Yours.</b> I would also like to know what you mean by this: The program is available for $ 29.95, but the winners of our contest will get it for free. extremely confusing installation and registration process. the install center pops up.. what do I need to install? Also, it automatically selects upgrade, while stating this MUST NOT be done. The code is not revealed, even though I have "V" on all 3 requirements. And even if I had it, I dare anyone to find out where I'd enter it in the software. extremely confusing installation and registration process. the install center pops up.. what do I need to install? Also, it automatically selects upgrade, while stating this MUST NOT be done. The code is not revealed, even though I have "V" on all 3 requirements. And even if I had it, I dare anyone to find out where I'd enter it in the software. strangest giveaway yet.